It was like NOTHING seen before …. Even the Republicans questioning Obama’s Admin people diin’t get like this…. This was open warfare between the Trump admin and Congressional Democrats …. 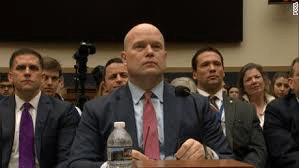 Matt Whitaker won’t be Attorney General for long…. Acting Attorney General Matt Whitaker put on a performance today that’s likely to leave plenty of top Trump officials even less excited about the prospect of their day on Capitol Hill. The big picture: After two years of being left alone by Republicans, Trumpworld is staring down the barrel at two grueling years of no-win situations before House committees. If you play nice, President Trump has shown plenty of willingness to publicly go after his own people. But if you play not-so-nice, as Whitaker did at times today, you can expect even more scrutiny from subpoena-empowered Democrats. “Whitaker declined to defend the special counsel’s investigation,” a break from Jeff Sessions and AG-nominee William Barr. “Whitaker said multiple times that he did not discuss the Mueller investigation with anyone at the White House, even though in July 2017 he interviewed to become a White House lawyer who would manage and respond to that inquiry.”…. The former acting attorney general is sticking around…. Us taxpayers keep paying this guys salary….